The Soundgarden frontman is back in solo territory with his new single, “Nearly Forgot My Broken Heart.” Produced by Brendan O’Brien, this is the first song on Cornell’s forthcoming album, Higher Truth, and it’s paired with an excellent lyric video by Josh Graham. On the first listen, this song’s arrangement reminded me of Cornell’s first solo album, 1999’s Euphoria Morning, which was remastered and reissued earlier this month as Euphoria Mourning. In this Kerrang! interview, Cornell discusses his solo career and new album. What’s most interesting to me is that “Nearly Forgot My Broken Heart” originally began as a country song! How interesting is that? I’m always fascinated by the way songs evolve from their early demos to the finished product. Today, I’m featuring a song from one of my favorite new(ish) bands, Wolf Alice. Hailing from London, England, members Ellie Rowsell, Theo Ellis, Joel Amey, and Joff Oddie have a sound that seamlessly blends rock, pop, folk, and other genres. I discovered Wolf Alice’s music in late 2013 when “Fluffy” played on my “Hole” Pandora station. I liked what I heard, but after hearing the Blush EP, I was 100% sold. After a mac ‘n cheese cook-off and fireworks show on July 4, I watched Singles, one of my favorite feel-good movies, with a relative who’d never seen it. I got inspired to watch the film again after seeing the Facebook event for a screening of Singles at the Seattle apartment where it was filmed, which ultimately did not happen (bummer). Since then, “Dyslexic Heart” has been stuck in my head on repeat. Usually I like to feature weightier songs, but hey, some Tuesdays call for catchy, upbeat tunes. Reminder to self – you can enjoy music that doesn’t punch you in the gut with its heaviness. Lately, I’ve been listening quite a bit to Pearl Jam’s Binaural (2000). I feel it’s their most underappreciated album, and this week I’ve chosen my favorite track, “Parting Ways.” Several songs on the album use binaural recording techniques, which is the use of two microphones to create a “3D” sound. The band employed producer Tchad Blake to help create that sound and feel for Binaural. I’m really interested in binaural recording and every time I listen to this album, I uncover new sounds. Although “Parting Ways” does not use the binaural technique, it’s no less of a treat to listen to. Make sure you’ve got a good set of headphones for this one. It makes all the difference. Virginia-based band Carbon Leaf has been going strong for more than twenty years. The founding members met while attending Randolph-Macon College in Ashland, Virginia before relocating to Richmond, Virginia. Current members Barry Privett (lead vocals), Terry Clark (guitar/vocals), Carter Gravatt (guitar/vocals/various instruments), Jon Markel (bass), and Jason Neal (drums) are known for their energetic live shows and a sound that blends elements of folk, Celtic, and other musical styles. 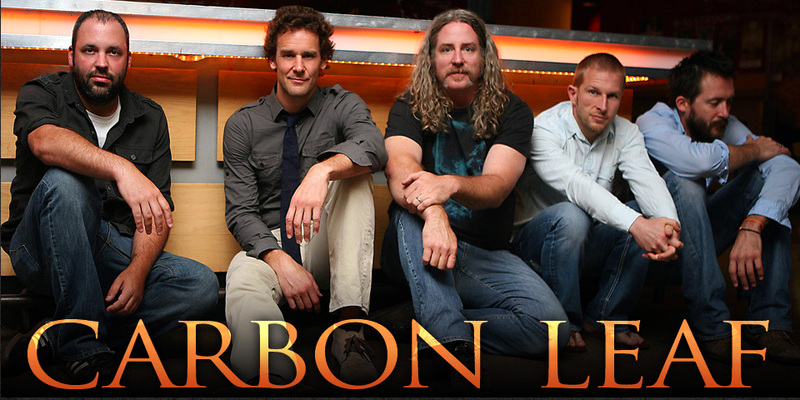 In August 2014, Carbon Leaf released Indian Summer Revisited, a tenth anniversary re-recording of their 2004 major label debut, Indian Summer. On March 20, 2015, the band played an excellent set at the Cat’s Cradle, which included a beautiful, completely unplugged performance of “One Prairie Outpost.” A few hours before the show, I sat down with Barry Privett to discuss the band’s decision to leave a major label, songwriting process, and contributions to save Sweet Briar College, among other things.